I’ve always been interested in career services. Those of us who have enough life mileage 😉 may have visited a career service in high school or university to do a range of aptitude tests, and be matched with an ideal career (mine was ‘lawyer’ – not sure what this says about me??). Others will have visited the career service to talk with a counsellor about changing courses, or how to find a job after they graduate. The work of the university career practitioner has become increasingly complicated and demanding over the last few years. Not only have careers themselves become more complex and mutable, but the career service’s client base and range of activity has become far more diverse. For instance, I’ve noticed that it is now very common for career staff to be engaged in a massive laundry list of activities at the university, covering: curriculum and learning resource design and teaching; industry brokerage and partner relationship development; staff professional learning; institutional marketing and promotions; and creation of institutional policy and strategy, in addition to ‘traditional’ career counselling activities. Another disruptor is digital technology and social media. The use of digital tools means that the reach of the career service can be far greater than before, but their use is also associated with a range of interesting challenges. The structural positioning and overall focus of many career services has changed as well. With the rise of the graduate employability agenda and a sector-wide focus on preparing learners for careers (or at least initial career outcomes) (Jackson & Bridgstock, 2018), some career services are suddenly finding themselves in the institutional spotlight, taking on significant responsibility for the university’s approach in this area. Others are capitalising upon burgeoning leadership interest in work integrated learning and employability skills to foreground the possibilities offered by an integrated institutional approach to career development learning. However, in other universities career services continue ‘out in the cold’ as “stand-alone entities, often organisationally aligned with student support services or marketing departments” (McKenzie & Howell, 2005), and are not (yet?) part of university-level conversations about learning and teaching. University career services: No longer out in the cold? In my keynote address at the Career Development Association of Australasia conference coming up in Hobart in May, I’m going to explore how career services and individual practitioners are responding to the disruptive changes to career development practice I’ve outlined above. I’ll talk about how they’re surmounting challenges, and reinventing themselves and their work to continue to best support the career development of learners. –	how career services managers and university leaders perceive the future of the career service – what’s coming next, and how can they prepare? I invite you to join me in discussion on these topics at the conference. I am very aware that delegates will have relevant lived experience in their own contexts and practices, and I’m keen to take the opportunity to learn from you, as well as sharing what I have discovered so far. If the technology is amenable, I’ll lead a structured conversation about your experiences of the disruptors, the approaches you are taking to navigating these, and the ways that we can work together to assure the future capability of career development practice in educational institutions. Dey, F., & Real, M. (2010). Adaptation of Casella’s Model: Emerging Trends in Career Services. College Student Educators International. McKenzie, M., & Howell, J. (2005). A snapshot of Australian university career services. Australian Journal of Career Development, 14(2), 6-14. I’m in Canberra. I’ve been attending the 2018 Universities Australia conference*, and I’m writing this from a corner in ANU’s ageing Art & Music library (I love the smell of it – oh the nostalgia! It reminds me of my undergrad days at UQ, when I would spend solid days in places like this. At the time I didnt realise the luxury of it). Alas, today my usual spot in the Chifley library is not available, because it’s being knocked down to make way for a schmick new student hub. Australian universities are in an interesting spot right now. Everyone’s committed to expensive infrastructure projects, and some are going into significant debt to do it. In my current city of Adelaide, we have a new University of Adelaide building for health and medical sciences going up right next to a UniSA cancer research institute on North Terrace. The rumour that UniSA added a spire to the top of its building to make it slightly taller than the Adelaide one hasn’t been confirmed beyond doubt, but there’s definitely some competition going on. Many of these infrastructure projects are aimed at attracting students and industry partners, and bringing our activities into the 21st century. All of them started earlier than any concrete promises of government funding ‘reforms’ or MYEFO**. At that stage, we were all chasing increased student demand, and there was a sense that we could keep expanding forever – although actually after a big increase when the demand driven system was introduced, enrollment growth stabilised at just below population growth by 2016-17. Last year in my committee-plenteous middle management university job, I would field at least two new course proposals per month that made claims*** about being able to find amazing student load from entirely new sources. Now we’ve put the anchors on. 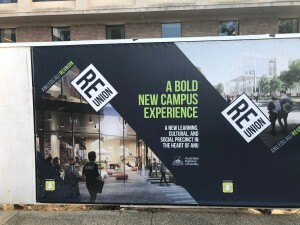 In the last two months the buildings have still been going up, but the Commonwealth $ will be the same, at least under the Coalition goverment, and later will be linked to ‘performance’ in various ways – most probably QILT indicators of student satisfaction, student retention, full-time grad employment and so on. It’s no surprise that now universities are variously looking for more money from international student load (FPOS), and domestic full fee paying students (micro-credentials for executive education, anyone? ), both of which are risky moves. They are also looking seriously at belt-tightening, rationalisation and efficiencies, which is what the minister has been talking about for a while now. So here’s a question: Are universities indeed ‘too fat’? Universities all report their top level financial results to DET. Most post a surplus of between 2% and 6% (not so much regionals and dual-sector unis, many of which are definitely struggling), but according to UA, the average surplus has been declining over the last few years. These surpluses aren’t about profit, because universities are not-for-profit entities. The surpluses are instead what the university has on hand at the end of the year, including money from things like research and capital grants for which spending is already committed for the next year. The surplus figures are therefore not a great indicator of how much belt-tightening universities can stand, or might need. So how efficient are universities in doing what they do? Is there more room for efficiency? By ‘efficiency’, I mean obtaining maximum value with minimum wasted effort and expense. This is a hard one, and one that VCs differ on somewhat (most recently, Margaret says yes we can be more efficient, at least with investment in infrastructure and technology, Glyn says no – specifically in terms of academic to professional staff ratios, and Jane also says no – in terms of the salaries and superannuation that academic staff receive). To tell you the truth, the whole conversation makes me uncomfortable. The reason is that in pursuing university efficiency, we risk ending up negatively impacting our #1 stakeholders – our students. We risk ending up with very large face-to-face class sizes; courses ‘put online’ with not enough consideration of good pedagogy; ill-prepared, harried teachers; poor assessment feedback; and not enough support for students who need help, amongst other things. I am not saying that we shouldn’t pursue efficiency. I just think that we need to do it carefully, and using blunt indicators such as surpluses and staff ratios is highly problematic. 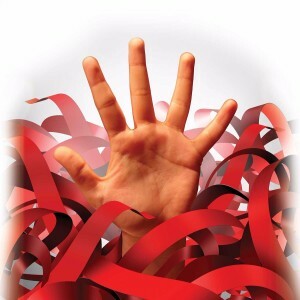 Here’s one challenging issue we could start with: Like many others, I have noticed that universities are afflicted by the ‘red tape plague’ that affects many large organisations these days. We’re busier than ever, with many academics working more than 60 hours per week, and this makes staff on the ground very angry when the Government suggests we need to tighten our belts. As an academic, I now spend far more time than ever before filling in forms, sitting in committees, and administering things… or clarifying confusion and roadblocks about forms, committees, systems, and administration. This is partly driven by reporting, KPIs and overregulation (apparently universities have the most reporting requirements of any Government funded sector), it’s partly that our systems and processes are becoming more and more complicated and sometimes don’t work together very well, and it’s partly the risk management culture. Academics grumble about not having enough professional staff to support them with all the red tape, but I dont think this is really the issue. Seriously: how do we reduce the administrivia in university life, and focus on core business? *I might post about the contents of this later on, if I have time. It was very focussed on workforce changes because of automation, which disappointed me – it was a bit narrow and superficial, with some exceptions. **MYEFO – ‘mid year economic forecast’, a euphemism for the recapping of funding for Commonwealth supported student places that happpened at the end of 2017, representing an end to the demand driven funding system. In a disrupted age where we don’t know which jobs will exist in the future, and young people can expect to have 19 jobs across 5 industries in their lifetimes*, how do you plan your career? How do you know which education / training course to choose? 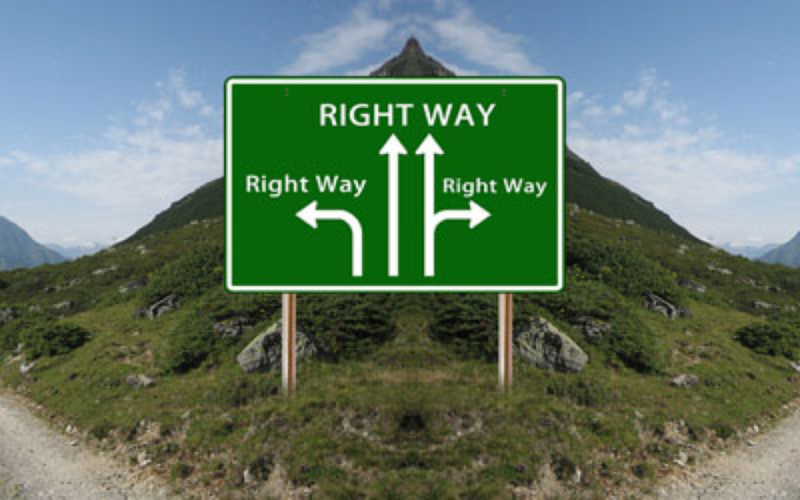 How do you know that the choices you are making are the right ones? When I present about the future of the world of work and careers, these are by far the most common questions I receive from audiences. There is a great deal of anxiety out there about employability and the future of careers, particularly given that course fees are higher than ever, and it can now take 4-5 years for university graduates in some fields to find career roles. In this post, I’m going to share a simple process for individual 21st century career development. It is based in design thinking approaches, and also has resonance in lean enterprise methodologies, and anyone can do it. 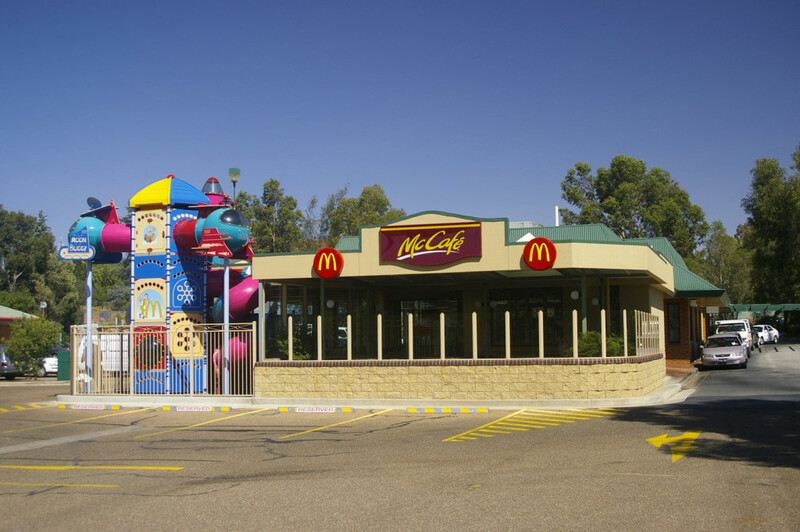 People often approach career development like they are opening a McDonalds franchise. There are more than 37,000 McDonalds restaurants worldwide. Each new franchisee is pretty certain that they will have many customers and turn a reasonable profit, because within reason there are known outcomes. The whole idea of franchising is that if you pay the money and follow the formula, you’ll be successful**. People can often approach career development in exactly the same way. They think about what career success or a desired role might entail for them, and then they attempt to follow a formula to reach it (‘study hard in school, get into teaching at university, study hard at university, finish my degree, become a registered teacher, apply for a job at x school…’ etc). This approach doesn’t work for a few reasons. The first is that the desired end will almost definitely change, as we learn more about ourselves and the world of work, as we go through our lives, and as the opportunities out there change. The desired end may not even be what we thought it was in the first place (‘I thought I wanted to be a teacher, but now I realise teaching isn’t anything like what I thought’). In actuality, about 6% of adults end up doing what they thought they were going to do career-wise when they were young (Polavieja & Platt, 2014). The second is that lock-step or formulaic approaches and strategies often don’t work either, and can mean you miss out on opportunities***. Careers are never linear — even very successful people (actually, especially very successful people) stumble across opportunities and end up in unanticipated places. So how should you approach career development? My answer, based on research with people who are satisfied with their careers (and happily it turns out that most of us are), is kaizen. yourself, and also the world of work. It is also grounded in exploration of the world of work. What are the opportunities out there? What skills and capabilities are required for different roles? Do the opportunities fit with your values and priorities? Understanding happens through exploration (e.g., talking to employers, career consultants, parents, friends; directly experiencing work and workplaces) and reflection. For those feeling a bit paralysed by indecision, a quick tip: Your understanding doesn’t have to be anywhere near perfect to go on to the next step, and your understanding will increase as you take action. 2. Make a (small)(provisional) decision. This decision is about what you’d like to try next. The beauty of it is that there is no ‘wrong’ answer – the decision is provisional, and simply guides the action you’ll be taking next. Because the decision is a small and provisional one, it’s relatively easy psychologically to redirect and explore something else. If you discover through subsequent experience that it’s not a great fit, that’s OK; it all adds to your experience and will enrich what comes next. Try something. Take the first small step on the basis of your small provisional decision. Enroll in the course, find a business mentor, apply for the role, sign up for the internship. Once you’ve started to take action, it’s time to test and adapt. Do you feel as though you could be on the right track? If so, keep going! If not, you might need to revise your small provisional decision and shift course (accountancy doesnt seem like a good fit anymore? ), or maybe shift your approach (not the right mentor? Not the right degree program?). In so doing, you might need to increase your understanding through exploring options, making other small provisional decisions, or trying other actions. You could also decide to persevere for the moment to increase your understanding of the current path. 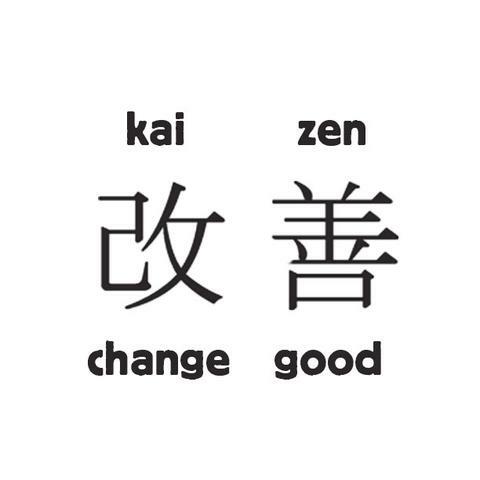 The most important part of the kaizen career process is that you keep going. Every decision is small and provisional, every action step is small, and testing and adaptation is happening all the time. It’s an ongoing process of enquiry and growth. We’ll never be ‘finished’, and that’s actually really exciting because we all get to keep exploring******. *according to the Foundation for Young Australians (2016). As one young person put it at an event I attended recently, “they say we’ll have about 200 jobs across 50 careers – I don’t know how they predict the exact number, or if it even matters. However you think about it, it’s a lot of change all of the time”. **The irony of this is that even opening a McDonalds franchise is no longer like opening a McDonalds franchise — they no longer have the market dominance they once did, and are changing business models and products to accommodate a market that has different needs. ***don’t get me wrong, I’m not saying that choosing an appropriate degree and studying hard aren’t good ways to progress your career – I’m saying that thinking about these decisions and being open to additional opportunities and possibilities is also important. ****following curiosity and interest seem to be better predictors of career satisfaction than following ‘passion’. Elements of intrinsic motivation are important for career satisfaction, but passion puts a lot of needless pressure on people, limits their options, and feeds into the ‘McDonalds franchise’ idea by asking us to overcommit. What if you don’t feel passionate about any career options? What if you are passionate about several at once? What if you feel passionate about a career option now, but know from experience that you’ll have another passion next week? What if your passion doesn’t match up with the opportunities on offer? In actuality, passion for elements of one’s career often happens after quite a lot of career experience. ******checking my privilege here — I am aware that there are many, many people for whom work is acutely about survival, and managing significant financial/food/housing insecurity in their lives. In an age where learners can download all of the content they want for free, there is limited value in continuing to feed them a pre-digested, pre-prepared curriculum. The institutions that will thrive in our age of digital hyper-connectivity will do so because of the quality and depth of the learning experiences they offer, the relationships that they foster, the networks that they broker, and their bespoke content generation (research). In the first two installments last year, I talked about the importance of interdisciplinary experiential learning, and of building a strong community of learners, teachers and industry/community. In this third installment, I’m going to make some remarks about the future university as hub of a global learning and practice network. Generally speaking, universities are extremely ineffective at social networking. They focus on short-term, transactional and contractual relationships with students and research / commercial partners. They lock down their infrastructure and put their learning resources behind firewalls (cf MOOCS, but these have other problems I’ll get into in another post). They don’t understand that the most productive relationships, even in the online realm and involving payment, are long term, based on trust, and involve sharing and reciprocity. In the conventional university the pedagogy is closed and walled, with a curriculum that is more or less one-size-fits-all-learners, and based on a distributive (transmissive) system. By contrast, people like George Siemens and Stephen Downes talk about connectivism and networked pedagogy — the idea that learning can be open and connected, characterised by self-regulation, co-creation and investigation. In networked pedagogy, the network is diverse. The learning is adaptive, and adapted, to individual and network needs. I think that universities are changing.They are employing industry engagement personnel, albeit still mostly for research development, and purchasing CRM systems. They are trying to improve their responsiveness to industry skill needs. However, they still aren’t as responsive as they need to be, in part because they are still addicted to curriculum content (as are the professional accrediting bodies). Our curriculum is quite static. It takes a long time and usually many committees to renew. I have a vision of the future university as hub of a learning network, encompassing industry, professionals, users and researchers. The university becomes a conduit and knowledge integrator for the latest university and industry generated research and practice trends that students and professionals alike can access as needed. Learners can forage within the network for task-relevant knowledge and information, and apply it to their practice, with the support and facilitation of teachers. They can make new contacts and find new collaborators. I think I’m actually talking about a ‘meta’university’ model here — overarching, accessible, global, and community-constructed frameworks of materials and platforms. The universities with the best pipelines to industry and academic research, practice and people, that can supply these to learners in useful ways, will be the most successful. Last month I delivered a ‘grand challenge’ public lecture at Queensland University of Technology. The Institute for Future Environments hosts these lectures, which, as you’d expect, are all about the big challenges facing humanity, from feeding the world’s booming population to managing scarce natural resources and reducing our carbon footprint. Over the years they’ve hosted people like Professor Federico Rosei from the University of Quebec, who presented on new technologies for energy sustainability, and Professor Kevin Burrage from Oxford University, talking about personalised medicine. My lecture was (of course!) about why, given disruptive changes to the world of work, society, and education, we all need to be future capable, what future capability means, and how we can all learn to be future capable. This presentation asks what it means to be capable in the context of a world of work and society undergoing massive disruptive change under the influence of digital technologies. It engages with the key shifts that are occurring to the labour market, work and careers, and explores the 21st century capabilities and skills that research suggests will be important to graduates’ productive participation in the years to come, including capabilities for complex problem solving and innovation, enterprise and career self-management, social network capabilities, and digital making skills. It suggests some key ways that universities can foster 21st century capabilities, and some strategies for building agile and dynamic educational institutions that are as ‘future capable’ as the graduates they produce. Edit: I was succesful in my application, and as of June 2017 am now a Principal Fellow of the Higher Education Academy! I just finished writing a new application to the Higher Education Academy. I became a Senior HEA Fellow in mid-2015, and posted about my teaching philosophy then. This time, I’m going for the big one: Principal Fellow. There are about 700 Principal Fellows worldwide, and these people tend to be highly experienced senior staff with strategic institutional and sectoral leadership roles in learning and teaching. I’m applying for my Principal HEA Fellowship through QUT’s scheme QALT (QUT Academy of Learning and Teaching). My application involved about 8,000 words, all-told : a reflective account of practice demonstrating that I meet all Dimensions of the PSF at Descriptor 4 level, a record of educational impact (list of roles and activities), three advocates reports, and my learning and teaching philosophy statement. This application drove me nuts. It was much harder to do than my previous one, and not just because it was four times the length. I had trouble pulling apart my integrated experiences to address the different criteria. I dithered over my reflections and wondered exactly which examples of practice should go where. It took me a total of two months at 1-2 hours each work day to draft and then edit the thing. I copied-and-pasted my teaching philosophy statement, read it over, and realised it didn’t fit. Not because my philosophy of teaching has changed; but because the focus and scale of Principal Fellow is completely different. In my SF application, I spoke largely about the learner, and the role of the teacher and the learning environment. In my PF application, I started my philosophy the same way, but got far more into what I believe higher education is for, and which pedagogic principles and practices should infuse everything we do. It got quite grandiose, really. Anyway, here it is. Upon reflection, most of my work has this kind of focus rather than at the SF level, so while the PF application was harder to write, the PF aligns better with my thinking and practice. Cross fingers that I am approved — my application now goes to three reviewers, and I will hear back in about 8 weeks. I believe that higher education is vitally important to personal, social and economic well-being and growth in the 21st century knowledge society. Universities are responsible for teaching high level capabilities that are needed for leadership, social responsibility, innovation and problem solving, all of which are integral to navigating a successful global future. Given this mandate, I feel that contemporary university programs must be orientated towards real world relevance and application – that is, they must be of use – as well as continuing to support learners to develop disciplinary depth and high level critical capabilities grounded in history, theory and context. Education for relevance and application should include the development of ‘future capabilities’, including disciplinary agility, enterprise and entrepreneurship, digital literacies, social network capability, and career/learning self-management, all of which are often sorely lacking in university graduate capability lists and curricula (Bridgstock, 2009; 2015). I often argue that in a world where more and more information is available online for free, provision of pre-digested curriculum content is much less important than previously. Universities will soon be differentiated by the provision of quality learning experiences that develop future capabilities, and the extent to which they foster the growth of learners’ professional relationships and networks. Thus, in order to meet the future capability needs of learners, teachers and educational institutions need to be future capable as well. My perspective on the dominant pedagogic approaches taken by the future capable is exemplified in my distributed knowledge network model of the university depicted in the figure below (Bridgstock, 2016). The model is based on research I conducted into the actual and preferred learning strategies of digital industry professionals (Bridgstock, 2016, published online), and is designed to create a responsive, continually updating curriculum. 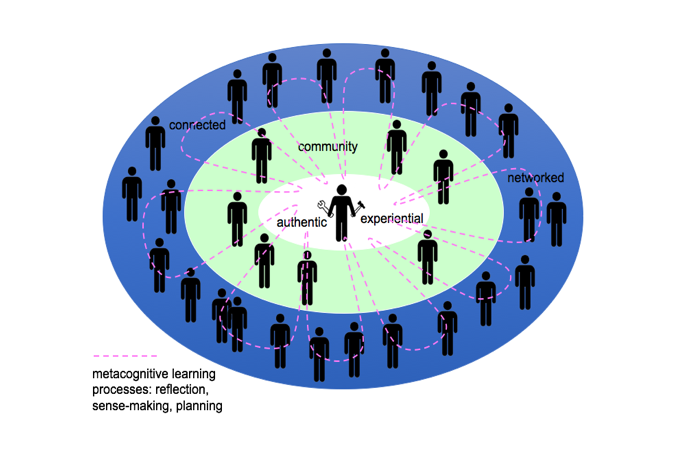 It has grounding in, and integrates ideas from, experiential, active learning theories and authentic learning (Dewey, 1938; Herrington & Herrington, 2005), social constructivism (Berger & Luckmann, 1966), communities of practice and enquiry (Lave & Wenger, 1991) and connectivism (Siemens, 2005). At the centre of the model is the learner who is engaged individually or in a group in task- or enquiry- based experiential learning. The green ring depicts their learning community, which may include other learners at different levels of capability, teachers, and industry/community members. The community is embedded into a much larger distributed knowledge network comprising global digital and face-to-face connections – such as learners, teachers, practitioners, industry, users, and other interested individuals. The acquisition of capability occurs in cyclical manner between authentic activity and the ‘classroom’ (whether physical or virtual), with teachers scaffolding learners’ processes of reflective metacognitive learning how to learn and emergent meaning making (Nonaka & Toyama, 2003). In strong contrast to the traditional ‘sage on the stage’ transmissive model of education on the 20th century (King, 1993), 21st century academic teachers must guide, coach, and mentor. They support learners to plan their learning, and then to filter, compare, contrast, and re-contextualise learning strategies and experiences, and identify new sources for relevant knowledge and skill acquisition, which is what learners will then do for themselves continually throughout the rest of their professional and personal lives. The learner is co-designer and co-constructor of their learning, which may traverse formal, informal, curricular and co-curricular realms as needed. In the future capable university, teachers are vital to ‘bottom up’ educational innovation and growth, and to the ongoing facilitation of high quality learning experiences (Salmon & Wright, 2014). For teachers to be effective, they must be supported by organisational structures and processes that are germane to new ways of working and teaching. Teachers’ bottom up actions must also be met by complementary ‘top-down’ policies and strategies. Thus, I work with teachers and institutional leaders to build future teaching capability. I believe in the power of transformational leadership in stimulating organisational change (Avolio, Zhu, Koh, & Bhatia, 2004) that inspires and stimulates new ways of thinking, and affirms and capitalises on existing practice. Berger, P. L., & Luckmann, T. (1966). The social construction of reality: A treatise in the sociology of knowledge. London: Penguin UK. 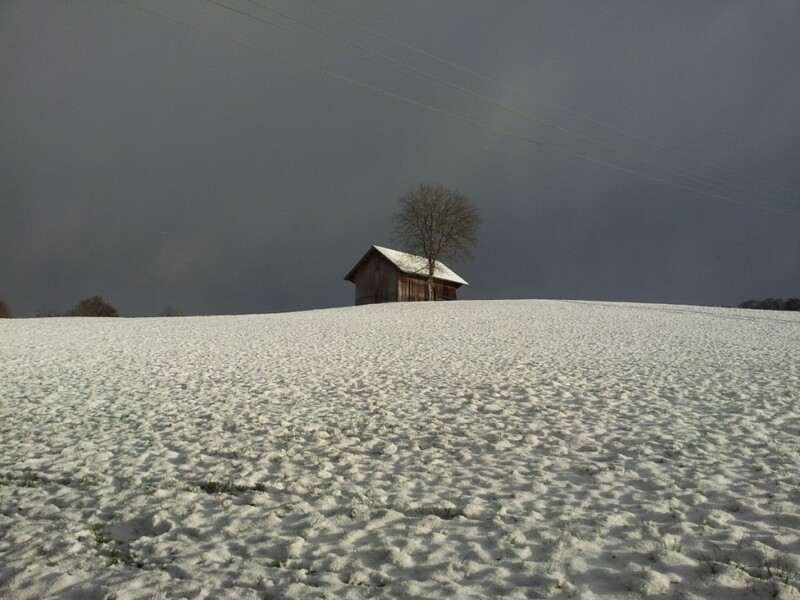 Bridgstock, R. (2016). The university and the knowledge network: A new educational model for 21st century learning and employability. In M. Tomlinson (Ed. ), Graduate Employability in Context: Research, Theory and Debate. London: Palgrave-MacMillan. Bridgstock, R. (2016, published online). Educating for digital futures: What the learning strategies of digital media professionals can teach higher education. Innovations in Education and Teaching International. Dewey, J. (1938). Experience and education: Simon and Schuster. Herrington, A., & Herrington, J. (2006). What is an authentic learning environment? In A. Herrington & J. Herrington (Eds. ), Authentic learning environments in higher education (pp. 1-13). Hershey: Information Science Publishing. Lave, J., & Wenger, E. (1998). Communities of practice: Learning, meaning, and identity: Cambridge: Cambridge University Press. Siemens, G. (2005). Connectivism: A learning theory for the digital age. International Journal of Instructional Technology and Distance Learning, 2(1). What should universities do about graduate employability? Recently, Australian universities have become highly concerned about graduate employability, and how to ensure that our graduates have positive career outcomes. It’s not that we didn’t care about this before — but recent graduate outcome statistics show that that chances of students gaining full-time employment after graduation are declining in all disciplines, and have been for a few years now. University education represents a signficant investment for students, both in terms of time and effort and course fees, and increasingly want to know that there will be a job for them at the end. The chief metric that the higher education sector uses to demonstrate positive outcomes is full-time employment 4 months post course completion. This metric comes from graduate surveys known as the Graduate Destintation Surveys (GDS), until recently administered by Graduate Careers Australia. Under the new QILT (Quality Indicators in Learning and Teaching) system, there are a range of other indicators as well — including a survey of graduate employers asking about graduate employees’ capabilities. There is also a ‘3-year out’ survey of graduate outcomes. The QILT website allows people to compare courses and universities using these indicators. However, the chief metric that is reported and used is still the short-term full-time employment metric, along with median graduate salary. The short-term full-time employment metric can be useful as an indicator in some respects. For instance, Tom Karmel of the National Institute of Labour Studies, has recently used the GDS to show that more than 50% of the variance in declining graduate outcomes is due to a softening labour market and an oversupply of graduates, particularly in some fields. This has been exacerbated by the introduction of the ‘demand driven system’, and uncapping the number of university places that can be offered in Australia*. The sector is on track to meet its 40% university participation by 2020 target. Another example of an interesting use of the graduate destination full-time employment metric comes from Denise Jackson from Edith Cowan University, who demonstrated the importance of social capital to initial graduate outcomes, also using statistical modelling of the GDS survey data (in her 2014 study, there was a 54% increase in the chances of full-time job attainment if social network strategies were used). However, the full-time employment metric we use is problematic in important ways. I summarise these issues as: (i) full-time employment as an employee, (ii) employment is different from employability; and (iii) short-term, narrow outcomes. 1. Full-time employment as an employee. The metric has long been criticised by educators in the arts and creative industries, where the portfolio career (multiple job-holding, self-employment) is ubiquitous – as, of course, is underemployment. But in fields where self-employment and multiple job-holding are common, the ‘full-time employment as an employee’ metric does seem less relevant**. It also might be less relevant across the board in coming years as the traditional organisational career continues to decline, and more and more people are engaged in self-managed, portfolio careers. There is evidence that this is occurring already: while Australia’s overall unemployment rate is steady, the rate of part-time and short-term work overall, and casual jobs for young people 18-24, is increasing. Eighty-six per cent of the new jobs created in Australia last year were part-time. Across OECD nations, 20% of all jobs terminate within one year, and 33% terminate within 3 years. In the US, 40% of work is contingent. There are also the phenomena of ‘uberisation’ of work, and the start-up economy. While self-employment is actually declining across Australia (according to ABS statistics), more and more people are engaged in informal, self-generated and distributed models of work and income earning through platforms such as Uber, Airtasker (Upwork in the US), and AirBnB. There is also much talk and policy about fostering a start-up economy, particularly in STEM fields, as a way to promote economic growth and social well-being in Australia. It seems that historically, an entrepreneurial career path has not often been chosen by recent graduates, and entrepreneurship is something that tends to be adopted with greater career experience – but it is something that is increasingly being encouraged. My overall point is this: The national graduate outcomes data collection is the only one we have. If the survey doesn’t include measures of more complex job and career arrangements, we have no way of knowing exactly what’s going on for graduates across Australia. For disciplines where full-time employment is less relevant, and as full-time employment as an employee becomes less common across the economy, it seems less and less useful as a way of describing the outcomes of recent grads. But of course the GDS (now the GOS in QILT) isn’t just used to describe outcomes — it’s used to benchmark universities and courses against one another. This brings me to my next reservation: employment is very different from employability. 2. Employment is different from employability. 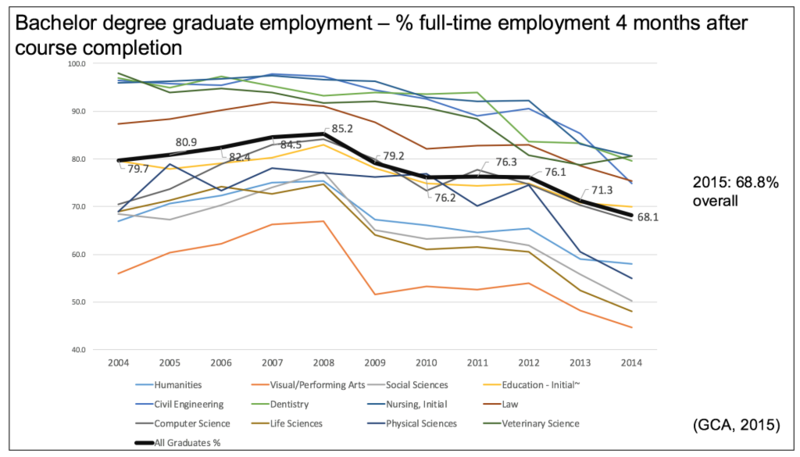 In the last few years, graphs of our declining graduate outcomes like the one above have been used to argue that universities need to be doing more to enhance our students’ employability. However, there are actually a wide range of stronger influences on whether a graduate is employed or not, including (as Tom Karmel points out) the degree of competition for entry-level jobs, and the availability of roles. 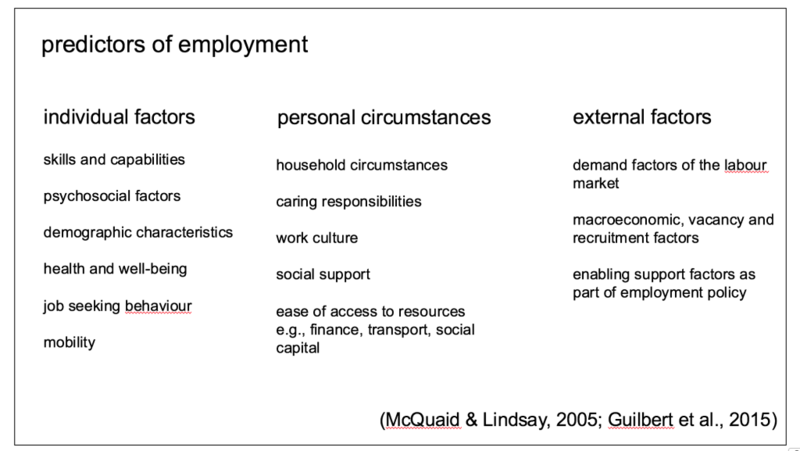 In 2005, McQuaid and Lindsay published a theoretical framework – one of many – of influences on employability and employment, which they summarise as ‘individual factors’, ‘personal factors’, and ‘external factors’. The traditional remit of universities has been just one element of these: skills and capabilities, and perhaps also some psycho-social factors that can be learned, such as confidence, proactiveness and resilience. I’d argue that there are indeed things universities can do, and can do better, to enhance their students’ employability (and also, while we’re at it, their citizenship and sustainability capabilities). But using graduate outcomes as the benchmark is leading universities to do things that are outside the traditional capability remit, in seeking to compete for one another for students — such as direct interventions around graduate recruitment, and changing the range and types of courses that they deliver to choose those with better short-term full-time employment outcomes. Universities with regional campuses in areas where there is higher unemployment are at a disadvantage in the benchmarking– and I would hate to see them move out of regions and stop offering degrees to people from diverse backgrounds because the graduate employment outcomes might be lower in these regions. 3. Short term, narrow outcomes. In a context where our KPI is short-term, full-time employment outcomes, universities are more and more ‘teaching to the test’ — which means we are paying close attention to employer surveys where desired graduate employabiliy skills are listed out (interpersonal skills, written communication etc), and we are paying close attention to the skills that professional accrediting and registering bodies say that they need. The idea is to make graduates as ‘oven ready’ as they can be – both in terms of specific technical and disciplinary skills for their professions, and their transferable / generic skills. One problem here is that the world of work is in massive flux. In teaching to specific outcomes, the danger is that we start encouraging narrow, inflexible career identities, and overly specific, short-term skills. When students graduate in 3 or 4 years’ time, there may not be the demand for (for instance) print journalists, primary school teachers, or graphic designers, and we need our grads to be able to reinvent themselves and their skills to find and obtain other meaningful work. We don’t teach enough for disciplinary and professional agility. The CEDA (2015) study into the automation of Australian work suggests that over the next decade, more than 40% of existing job roles will disappear anyway (goodbye taxi drivers and telemarketers!). Other entirely new roles will be created — and while it’s difficult to predict exactly what these roles will be, we’re seeing this already in statistics coming from the US around new jobs in information security, big data analytics, and social media. Further, the roles that will remain are changing, and will require different skill sets. Work roles will require more digital capabilities, emotional intelligence, creativity and complex problem solving, and complex manual dexterity (these kinds of skills are less likely to be automatable). 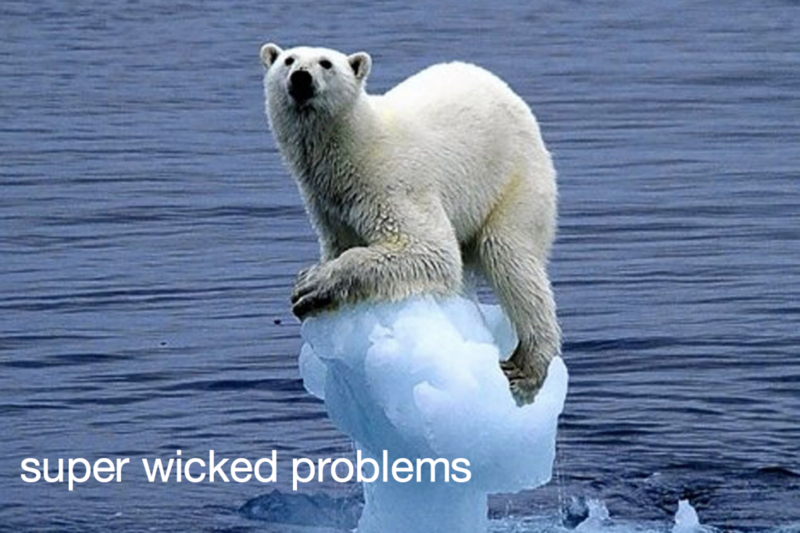 I also suggest that in this age of uncertainty and unprecedented social change and complexity, where we are confronted by more and more ‘super wicked problems’ — climate change, loss of biodiversity, antibiotic resistance, refugees and asylum seekers, widening gaps between the rich and the poor… and the list goes on — surely we need KPIs around capability development beyond employability skills. I read yet another article this morning about global catastrophic risk (nice reading to go with one’s cornflakes) that predicts our chances of destroying ourselves during the 21st century at about 50%. It’s hard to give exact probabilities on these kinds of things. However, the people who are graduating from our universities will lead our world in the coming decades — they need the capabilities to engage with and manage complex social, cultural, economic, and environmental challenges, as well as to find or create work and perform well in that work. So, what should we be measuring? Measurement and benchmarking is an inevitability in this space. It’s difficult to generate suitable, simple benchmarks for our graduate outcomes. I understand why full-time employment is used – it’s simple, and a good indicator of some things. However, we certainly need more nuanced, longer term outcome measures around employment, that embrace self-employment and the portfolio career as well as the metric of ‘short-term full-time work as an employee’. We need to provide indicators around the actual capabilities that our graduates possess, and their behaviour (such as setting up their own enterprises, if that’s what we want). These indicators need to include capabilities beyond short-term employability skills, to encompass broader employment outcomes and the changing world of work. Finally, I think we need to include social, cultural, and environmental capability indicators, and those of critical thinking and learning, as well as employability skills. In turn, we need the infrastructural, HR and policy supports in place so that our graduates are able to make the most of their capabilities. We need a labour market that can accommodate our skilled young people, and where they can make meaningful contributions. *the solution doesn’t seem to be to re-cap the number of places offered. In fact, Andrew Norton offers some interesting commentary about how limiting the number of places in courses actually results in worse labour market mismtaches than we have at present. He provides the example of the 1990s Government restrictive caps on medical student places, and points out that this resulted in widespread shortages of doctors, something that was eventualy mitigated by inviting many more overseas-qualified doctors to practice in Australia. ** I should note here that the graduate outcomes survey does include a measure of ‘part-time employment – seeking full-time employment’ — but it isn’t detailed enough to describe employment patterns. Some of the most interesting findings from my fellowship interviews are actually about university stakeholder engagement and networks (or lack thereof), rather than student professional connectedness. 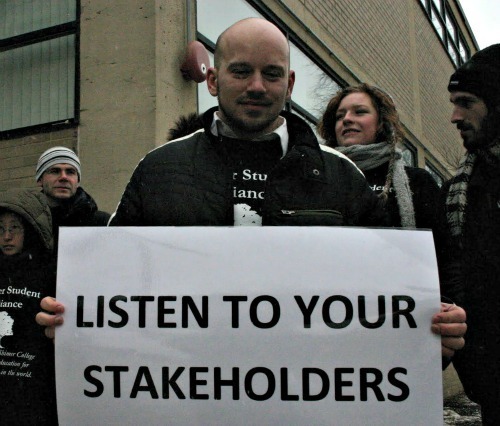 University approaches to external and internal stakeholder engagement are underdeveloped across the sector. Universities are still mostly taking short-term, ad hoc and often transactional approaches to working with our industry and community partners. While some universities do have stakeholder engagement strategies, these are often focussed on research and knowledge transfer, and they aren’t optimised for the mass teaching partnerships we are starting to embark upon. In my interviews I heard many stories of great attempts to partner with industry for teaching that were thwarted by university systems and processes, or that only worked because they involved ‘guerrilla teaching practice’ outside our systems (you know what I’m talking about), and that may therefore be limited in scale and sustainability. I heard about the challenges of working productively with partners across multiple organisational areas with multiple contact points and multiple different organisational processes. I heard variously about the risk of one person having all the contacts, the risk of sharing contacts with those who may not treat them sensitively, and the risk of the ubiquitous generic ‘contact us’ email address. Perhaps most commonly, I heard about how we need to learn to value our partners in building long-term professional relationships for learning and teaching. – who do we want our key industry and community partners to be, and what are we offering them in the long term? What value do we add? – how are we valuing partner input in co-creating learning experiences for and with students? – how can we ‘get out of our own way’, reduce institutional barriers to connectedness and improve engagement? – who are our key contact points in the university for industry and community engagement? What kinds of resourcing and support do they need? – how do we join up our engagement strategies and points of contact to improve consistency and quality of engagement? – How do we manage the risk of engaging external partnerships at scale? I’m keen to know what your experiences have been with building your program / organisational area’s professional networks. 1. what does your university do well / not do well in supporting the development of your industry contacts and relationships for learning and teaching? 2. what motivations do industry and community partners bring to their partnerships with you, and what types of value does your program / university offer them? 3. how are your intra-university connections? How well connected are you with others within your university that are doing similar work / might have similar partners? How often do you experience the ‘left hand doesn’t know what the right hand is doing’ phenomenon with partners or partnership processes in your unversity? How do you navigate these challenges? Send me an email if you like, or comment below if you dare… also I encourage those interested to join the GE2.0 community of practice, where there’s more info and discussion about these topics. July was a busy month for me. I interviewed 43 people in different roles from a total of 26 Australian universities, to build a national picture of higher education engagement with learning and teaching for professional connectedness. The team have also profiled a number of humanities, arts and social sciences graduates and industry / community representatives across Australia to explore how professional connections and networks are important for success in 21st century work and life (more on these findings later). Australia wide, universities are stepping up to the challenge of fostering graduate employability through industry and community engagement. There is a national movement towards the development of university-wide employability strategies and infusion of employability skills and career development learning into all levels of the curriculum and elements of the university experience. We are using a range of broad pedagogic approaches that support support the university-wide strategies, including: new models of WIL, alumni engagement, direct industry teaching, co-curricular facilitation and recognition, social media and professional identity building online, and connected learning. We continue to struggle with the resource-intensiveness of effective industry engagement, and the scalability of our programs. The ad hoc approaches that used to work with a small number of students across a few programs and a few industry partners are proving less effective as we move into an era where 100% of our students will experience learning that is integrated with, related to, and/or otherwise connected with the world of work. we need to go beyond Linkedin profiles. Development of student professional identities online is key to employability, but employers are looking for more than simple Linkedin profiles and ePortfolios. How are students actively engaged with their online professional networks? Do they have industry authentic blogs, portfolios, social media presences? Are they interacting with the professional community in meaningful ways? how are we supporting student networking? Many of our industry-engaged pedagogic strategies build a few strong professional connections. On average, students know only 1 employer when they graduate (often a WIL employer). How are we supporting our students to ‘network’ and grow their wider professional connections? professionals use their social networks to learn, but universities tend not to promote this type of learning. There are substantial opportunities for students, universities and industry in ‘connected learning’, building learning communities and communities of enquiry around mutual areas of interest and practice. How can we start to build these broader communities and networks and learn from each other? If you want to know more about what I’ve been finding in my interviews, head on over to the Graduate Employability 2.0 community of practice.